There are few things that Star Trek fans entirely agree on but the overall disregard for The Way To Eden is probably among them. 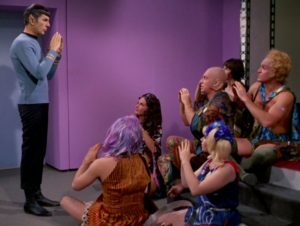 The notorious “space hippy” episode could have been a very intriguing story involving Dr McCoy’s daughter. Instead it was a jumble of conflicting messages and some terrible Russian accents. However, as with all episodes of The Original Series, there is usually something to find worthy of analysis and discussion. In this episode of Whom Pods Destroy Terry, Derek and Graham dig a little deeper into this episode and ask is it really as bad as people say?